This procedure explains how to add an "Object presentation" to a drawing style so that the "Weld preparation" feature displays in single part drawings. Since Advance Steel 2014 the "Weld preparation" presentation has been missing from some drawing styles. This will affect any part that has been modified using the "Corner cut" feature. The part is drawn but the corner cut is not displayed. The following procedure will also work for all versions of Advance Steel 2014. • Open the "Drawing style manager"
There are two sets of "Drawing styles" in the "Drawing style manager" – "Advance" and "User". In this FAQ you will edit the "User" drawing styles only. Although it is possible to edit the "Advance" drawing styles it is not recommended - they will always remain intact as a backup. Any changes to the "User" drawing styles will be reflected in the user "Drawing Styles" and "Drawing processes" in "Quick Documents". 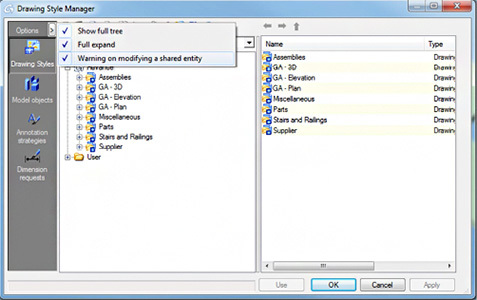 For these changes to take effect you must use the "User" selections in "Quick Documents". 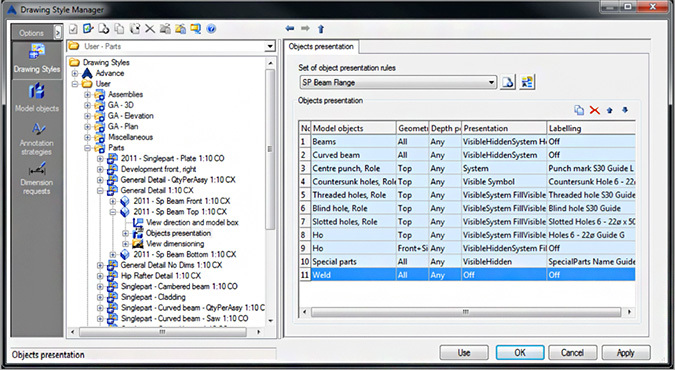 In the "Drawing Style Manager", under the "User" settings, expand "Parts > General Detail 1:10CX > 2011 – Sp Beam Top 1:10CX" and select "Objects presentation" by clicking on the name "Objects presentation". A dialogue and blue table will be displayed to the right – the table contains all of the elements that will be displayed in your drawing when the drawing calls on the drawing style" "General Detail 1:10CX" – this will be included in most drawings for single part plates. The "Model object" "Weld preparation" is missing from the list of objects so it is necessary to add a new entry. Click on the icon "Add a new object presentation"
A new line will be added to the "Model objects" table. The new line will depend on what was previously selected in the list. In the example the new line will be a copy of the "Model Object" weld. However, the content of the new line is not important as we will modify the entries. Expand the new "Model object" by clicking on the name and then using the arrow to the right to view the drop down list of available model objects. The list will highlight the existing value of the new "Model object". Change the value to "Weld preparation" by selecting it from the list. The model object "Weld preparation" can be found in the "General" category of the list. By the same method of selection, each field – "Geometric restriction, Depth position, Presentation and Labelling" – must be changed to match the table below. Each field has a drop down list available by clicking on the name in the field and then selecting the down arrow next to the name. When the fields match those shown above, click "Apply" to save the changes. The changes will now be applied to any drawing using the "Drawing style" – "General Detail 1:10CX > 2011 – Sp Beam Top 1:10CX". It is also necessary to add the "Weld preparation" model object to the other views in "Parts > General Detail 1:10CX"
By the same process add the "Model object" to the front view - "General Detail 1:10CX > 2011 – Sp Beam Front 1:10CX". It is not necessary to add the "Model object" to the "2011 – Sp Beam Bottom 1:10CX" as "Weld preparation" was added by the system automatically. Once all changes have been made to the "Drawing Style" select "Apply" and close the "Drawing style manager". In the Advance Steel "Home" ribbon "Update defaults" to activate the changes – "Home > Settings > Update defaults" Alternatively, if Advance Steel is closed, the changes will take effect when Advance Steel is next opened. The changes to the "Drawing Style" will not be applied to existing drawings. It will be necessary to delete and then recreate any existing drawing.